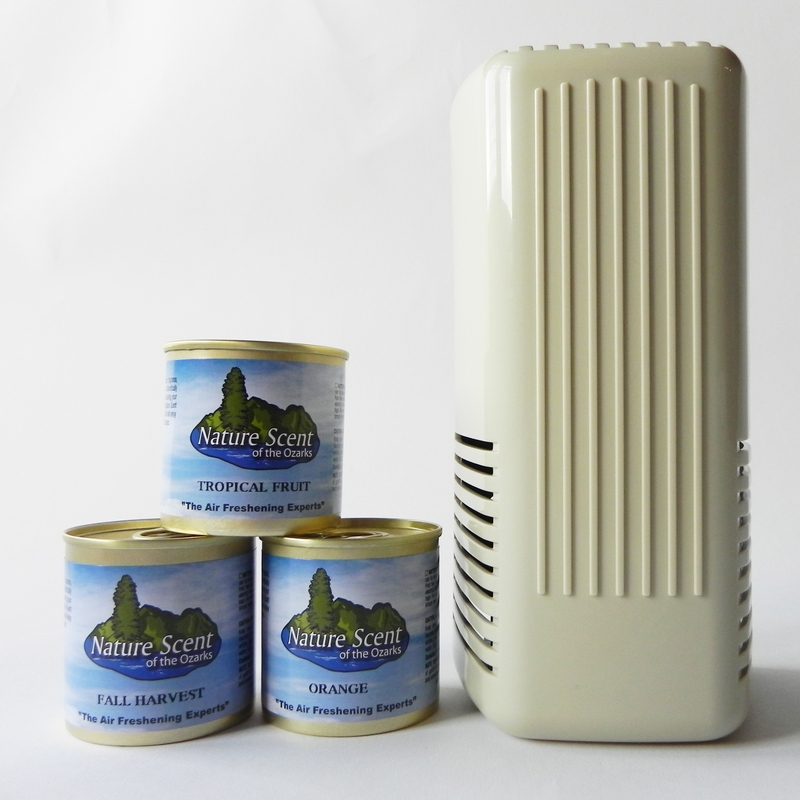 The Nature Scent Fragrance Battery Starter Kit includes the sleek designed professional battery operated diffuser (requires 1 alkaline D cell battery not included), 3 cans of liquid fragrance, and 9 paper wicks. The diffuser made of durable plastic for commercial application or home use can be wall mounted or placed on any undisturbed flat surface protected from tampering. Each 4.5 ounce can which contains natural extracts and essential oils diffused through the use of 3 wicks lasts at least 30 days in a normal temperature setting. Scents can be adjusted with the number of wicks used to be light, medium, or strong based on your requirements and expectations in public restrooms, your place of business or your home. The diffuser has a quiet fan speed for continuous and effective air freshening/deodorizing around the clock in an area up to 500 square feet of open space with normal ceiling height. For optimum fan speed to maintain odor control it is recommended to replace batteries approximately every 2 months. FREE SHIPPING ON ALL PURCHASES OVER $50 IN THE CONTINENTAL UNITED STATES. We also offer air fresheners for your automobile! Our aromatic air fresheners are superior to those available in most auto stores. Each one typically lasts from 6-8 weeks keeping your car smelling great! They are also great for placement in closets, camping trailers, or anywhere else you might desire aromatic freshening and odor control.